Hello! I feels good to be back on the ol' blog. It's been a while. As you may or may not know, I'm pregnant and have been quite ill. Happy news is, I'm finally starting to feel better, which means I'm feeling up to writing this post, just in time for today's Studio 5 television appearance. I've been delighted to be the official Gardner Village blogger this year. This local (and historic) shopping center is so cute. I adore working for them and sharing the many wonderful things they have going on. This week, that includes a massive Easter Basket Giveaway! Visit their blog between today and Monday, March 23 for your chance to win. Trust me when I say this is one prize pack you won't want to miss out on. To enter to win this $400+ basket of goodies from Gardner Village, click here. Good luck! Whether you ask The Easter Bunny to hide the full Easter basket in a secret place and leave clues, or you ask The Bunny to hide the basket's contents along with the clues, this is a very fun approach to take for both young and old. 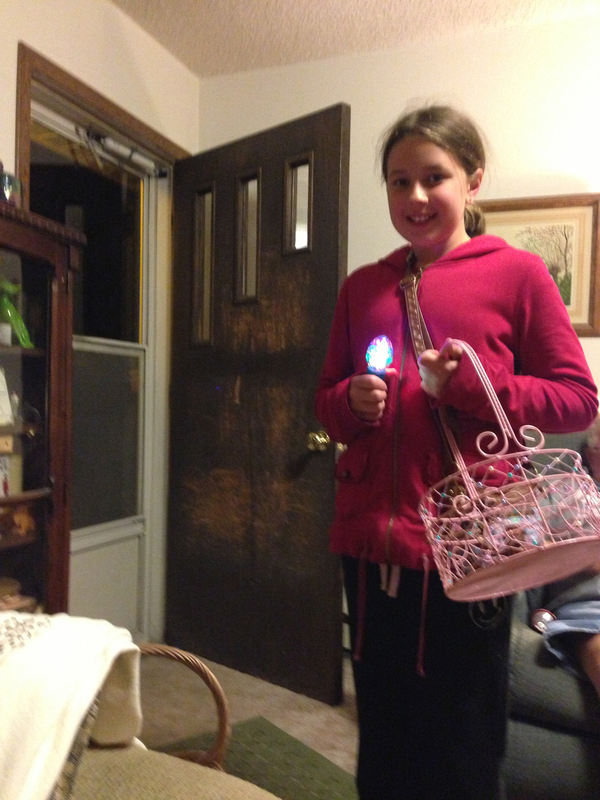 When hiding goodies along with the clues, simply start with a basket containing a single plastic Easter egg. Inside that egg is the first clue. As your little hunter goes about his or her search, he or she will fill up that basket with fun delights along the way. Your first clue, if you must be told, is waiting where we keep our food cold. Find your next clue without fail. Simply look where we get our mail. Your next surprise is in your very own bed. Search near the space where you rest your head. No, that is not a mirage. Your next treat sits in the garage. Seek your next surprise in a musical spot, where you've played the keys since you were a tot. Usually this is where we take in a flick, but it's nice the place to go for your next trick. Your next secret, I have a hunch, is located where the doggies eat their lunch. A bubbly place, rub-a-dub. You go here to get clean and scrub. It's that time; you're almost through. The basement is where you'll find your final clue. This is an activity that will keep your Easter celebrating going from the moment you sit down to Easter breakfast until long after sundown. 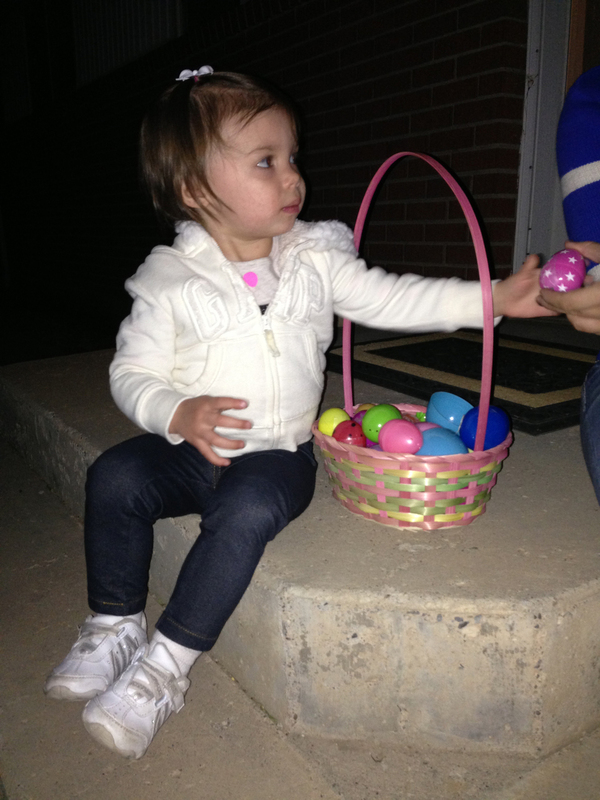 It's a nighttime egg hunt. My cousin arranged one for our kids last year, and they LOVED it. It's as simple as asking The Easter Bunny to fill eggs with either glowing toys or small glow sticks that accompany regular toys and treats. Talk about a bright idea! Instead of hiding treats in your eggs, have The Easter Bunny hide puzzle pieces. Before the puzzle is hidden, write a message that describes where the basket is waiting. This makes two activities in one, which can be double fun! Write numbers on eggs (note, I wrapped the eggs with washi tape first and then wrote the numbers so it wouldn't be permanent) and then let The Bunny do his hiding. The child whose eggs add up to the highest number wins a bonus prize. This is fun for younger children who are just learning to add. If you have multiples kiddos, this is an egg-celent idea. Assign each child a color (or color family) of eggs to seek. That way, kids end up with each shares and The Bunny can make some more difficult to find while others are easier. For added fun, incorporate baskets of the same colors. To see my sixth idea in action, which includes glitter and sequin filled "eggs," I invite you to watch my full segment today at 11:00 on Utah's channel 5 (I'll add the segment here when it's online). I'm the mom of two beautiful daughters and one crazy pup. I share my heart and soul with my handsome husband, Cory. Professionally, I write, edit, teach, and create. In the rare occasion I have some free time, I love spending it with family and friends. Target runs offer up some happy. Creating is a must in my world. And travel is something I fit in when time and budget allow. I love e-meeting new friends! Join me in one of my online classes today. They're open for enrollment anytime and you can go at your own pace, making them a convenient way to learn, no matter your location or schedule!